*Note: The Strength is only level 35, it goes up to level 40 with the Knight's Ring equipped. *Note, when it comes to armor feel free to use whatever you want while staying under 70% equip burden. Items: Resin of your choice. The point of this build is to be able to readily have options available to deal with multiple play styles and builds. While still utilizing the power of the Dark Sword. In this build the Dark Sword boasts a decently high AP of 400, while just being a Straight Sword. With this AP combined with the quick slash attacks of a Straight Sword we are able to easily bully our enemy, or spam down a group of foes. But this is also our weakness, the simplicity of the move set make this weapon easily parried. Also due to the reputation of the weapon, people love to spam parry at it. In order to counter all those people with off hand Ceastus and Parry Shields, we use a Zweihander. The two handed attacks of the Zweihander are unparryable. Using the Zweihander not only lets us throw off our foes predictions with weapon swaps, but also allows us to punish parry spammers with unparryable Zweihander R1s. The key point to this build is to punish people who like to parry. You'll want to play to the strengths of both weapons. It's the faster weapon, use it to chase down targets, go for quick two hit combos and bash down an enemies shield. You'll get more bang out of your weapon buff, due to the speed at which you swing. The weapon's speed also allows you to swing as your foe comes out of a roll. Mastering this is extremely powerful, allowing you to constantly get free hits in and bully your opponent into an easy win. 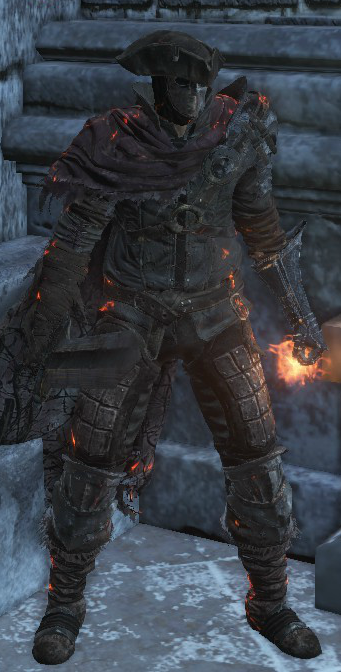 Two handed Zweihander attacks are unparrable. if the opponent is actively using a parry weapon in the left hand, switch to your Zweihander until he focuses on two handing his weapon, or has no parry weapon in the left hand. Once the threat of a parry is gone you may feel free to swap back to the Dark Sword. Despite the Dark Sword being the focus of this build, the Zweihander isn't only a tool to counter people who love to parry. The first hit of a Zweihander will stagger your enemy long enough for you to get a second swing off. Totalling around 700 damage (About 300 - 400 damage from each R1). Feel free to play around and tweak the build to your play style, for example maybe you want more Vigor or Vitality. As of version 1.06, the zweihander appears to no longer be unparryable.